Lina Herzberg, geb. Cohn (1881 - ?) was born in Frankfurt (Oder) and was married to businessman Heinrich Herzberg. Their two daughters, Ruth and Marel, managed to emigrate to England. 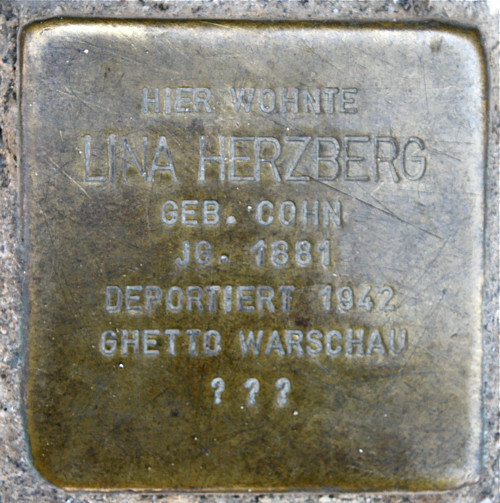 Lina Herzberg lived until 1941 at Theaterstraße 9 (today Franz-Mehring-Straße), where she rented out rooms. She later lived with five other people in Wollenweberstraße 60. In 1942 she was deported to the Warsaw ghetto. From that point nothing is known about her fate. Her name is immortalized on the wooden plaque in the Memorial to the Victims of Political Violence in Frankfurt (Oder).